Color and Spices: Sweet 'n sour chicken.. Kid and food, are two opposite words in many households. Many parents (mostly moms) face the biggest food challenge when it comes to cook something for their little one. Being a mother I can understand how it feels when your little one refuses to eat. Whatever little experience I have gathered over the last 6 years tells me that each kid is different from the other. You can never follow a single formula to treat or manage them. I can point out few things that might help parents who face this frustrating problem. First thing first, make sure there is a routine in the house, a study time, playtime and eating time. The routine not only helps everything go smooth, it also helps the parents to have some time for themselves too. Second, I would say do not force the kids to eat. Don't turn eating into some repelling session for them. There must be some reason why he/she does not want to eat. Find out the reason/s. A colorful kid-friendly food will definitely attract the kid. Try to make the food interesting. Do not make something separate for the kid. Serve the same food that you are having. If it is spicy then keep the spice level low so the kids can have that. Kids learn from us, make sure to have a family lunch or dinner. A physically active kid will always feel hungry, so getting these little ones to spend their unending supply of energy by involving them in physical activities also helps. I always try to make something interesting for my little one. When I find her enjoying something while eating in a restaurant, I try to replicate that at home. This time it was Sweet 'n Sour Chicken, the most common kid's menu in Chinese restaurants. 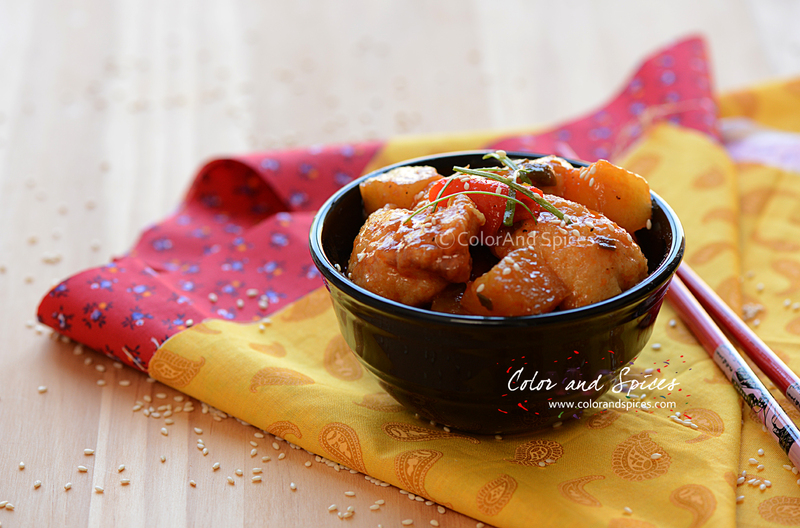 It is a quick and easy meal, and the children love the tangy taste with a slight dash of spiciness. I added little dry red chili to add a spicy zing, but you can avoid that. I used chicken breast to make this dish, to get a restaurant like softness I banged the chicken pieces with a heavy knife to tenderize it. 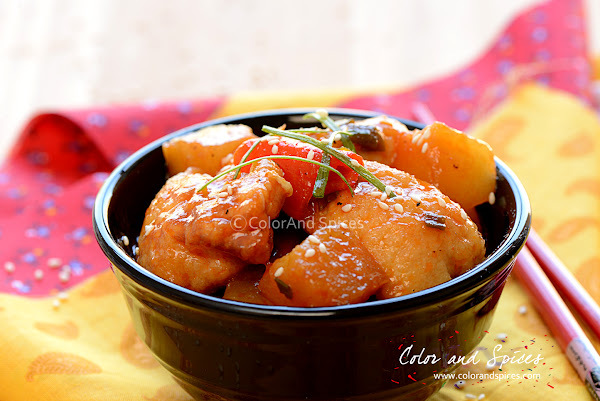 This sweet and sour chicken can be served with steamed rice, I served it with a spinach and corn rice, another healthy option for kids. Recipe for Spinach corn rice is here. 1. Clean and wash the chicken breast, pat dry with kitchen towel. Cut the chicken breast into bite size cubes. With a mallet or back of a heavy knife bang the chicken pieces, this will help to break down the fibrous meat and the end result will be soft. 2. Mix egg white, salt, cornstarch in a bowl and coat the chicken pieces in that mixture. Keep it for 10 min. 3. Mix all the ingredients for sauce, keep aside. I did not add any extra salt to the sauce, as ketchup and soy sauce both have a high amount of salt in them. 4. Heat 1 tbsp of oil( I used canola oil, use peanut oil for best result) in a pan. When the oil is hot add the chicken pieces. Do not over crowd the pan. The chicken pieces should be in a single layer, if needed fry the chicken in batches. Cook over high heat for 1-2 min, turn and cook the other side for 1-2 min. Take out the chicken with a slotted spoon. 5. Add another tablespoon of oil in the pan, add the julienned ginger, cook for 20-30 sec. 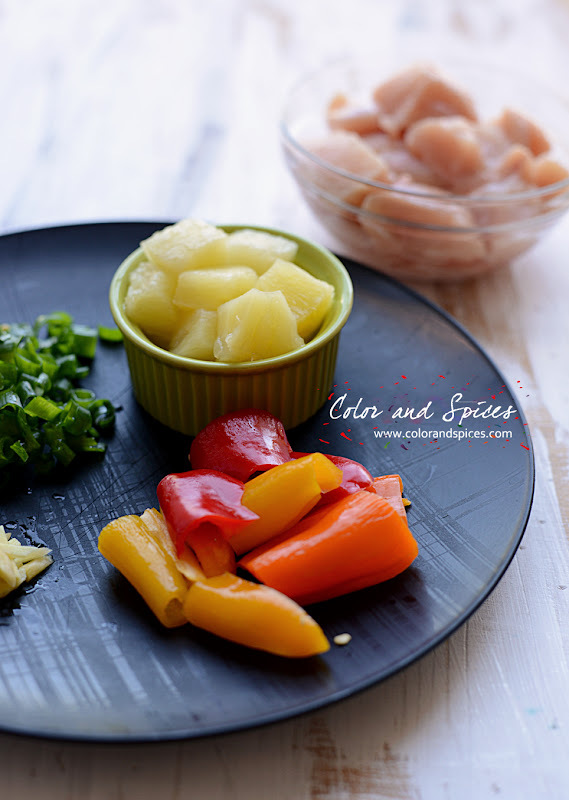 Add bell peppers, pineapple chunks, cook for few minutes. Add sauce, let the sauce boil. As the sauce boils add fried chicken, cook over medium heat for 4-5 min. Add broken dry red chilies(you can avoid this part) and give a good toss. Transfer to serving bowl, sprinkle chopped spring onion(only green part) and sesame seeds. Serve immediately. you are so right, to figure out what they will like its next to impossible. i also try to do replica. BTW dish looks awesome. do visit me too. 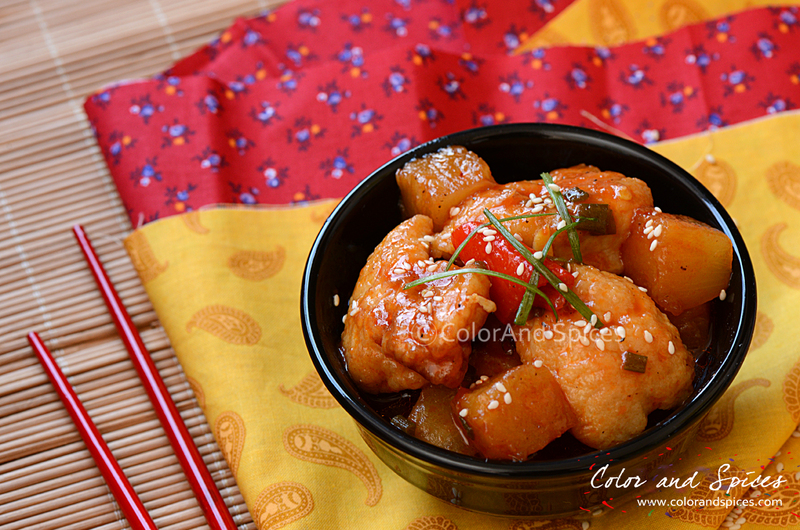 Mmh I like sweet and sour chicken but never made it at home, sounds easy enough, I'll give this a try! Thank you for sharing. Indo Chinese flavor always makes me hungry! Palang saaker ghonto and the bori story..